Today, First Lady Michelle Obama joined her husband in New York City. 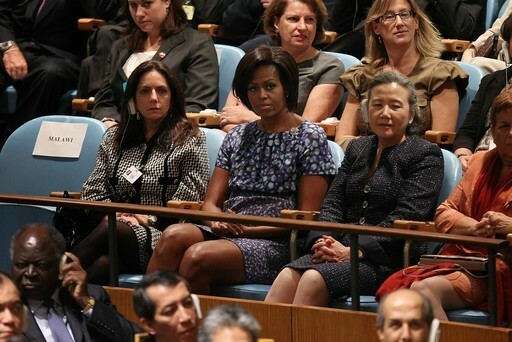 She watched from the audience as President Obama addressed the world leaders during the General Assembly at the United Nations Headquarters. This annual event exists to highlight the current global issues of poverty, war and environmental degradation. Mrs. Obama, seen seated beside the wife of UN Secretary General Ban Ki-moon, wore a printed, eggplant colored sheath by designer Peter Som. This style is perfect for Michelle! The pleating at the neckline creates the allusion of a larger bust, evening our her otherwise pear silhouette. Let me know what you think about the first lady! What are your thoughts on this look?